I can go haz sleep! 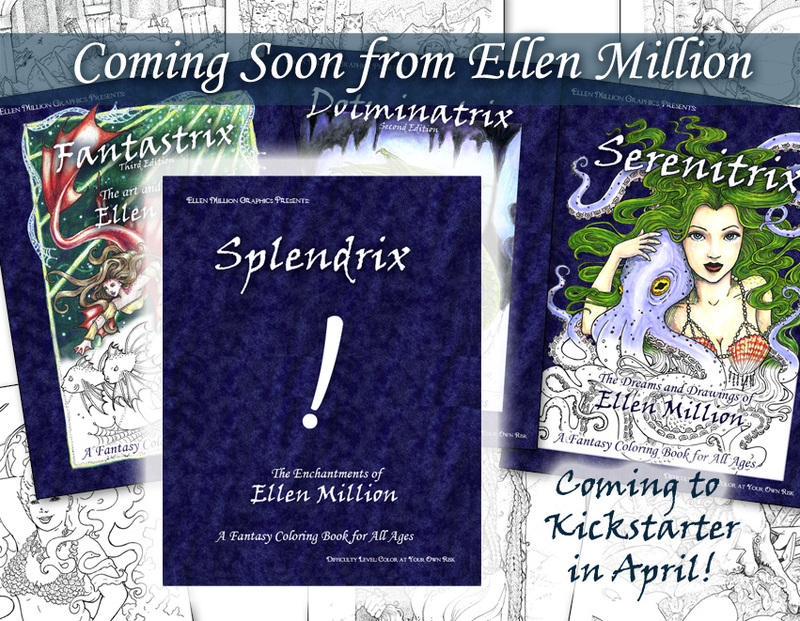 My tentative plan: run the Kickstarter the last two weeks of April. 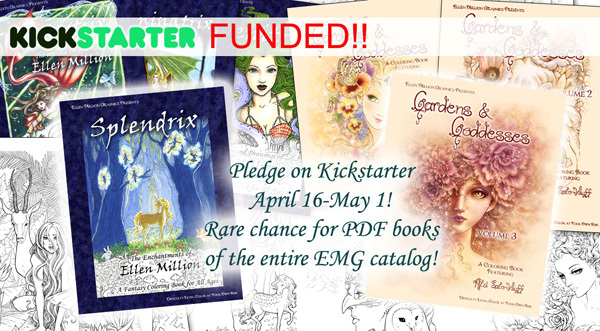 Garden and Goddesses Volume 3 (by Mitzi) would be the stretch goal. No collaborative titles this time... I have a basement full of coloring books and the market has chilled pretty significantly, and the group titles don't sell as strongly, as well as being more work. But I want another solo coloring book for purely selfish reasons, and I'm hopeful that the Kickstarter will stimulate some back catalog sales as well. I'm gathering up my resources and numbers and print files for this right now and should have a Facebook event and some concrete dates and such pretty soon. Which is also part of my next bit of exciting news, but that shall wait for another post. The twos in tarot are all about balance. The two of pentacles, in particular, is about balance of earthly things – wealth, business, and communication most specifically. Here we have an astronaut who is balanced in space, indicating the rich-looking, pentacle-adorned space ship she is attached to, and a satellite, which represents communication and more spiritual needs. It can be a tricky balance, complicated even further by blazing rocket boots! The infinity symbol from the traditional Rider Waite deck is hinted at in the curve of her tether, implying that the figure in question can handle an unlimited number of problems. Below her, a cold-war Russia and Alaska face each other under aurora-lit skies, representing outside conflicts. This card cautions us to manage our time well, and encourages us to remember that if we do, we can handle all the things life throws at us. This piece was an experiment from start to finish. I wanted a crisp, vintage look, and painted over my linework with acrylic before realizing that I had completely obscured my lines. Not daunted, I printed out my linework scan and colored it with Copic markers, then cut it carefully out by hand. That was the really sharp feeling I was going for! A few touches with colored pencil and gelpen were made at the very end. The original is 9x12, acrylic, marker, ink, and the kitchen sink (including glittler glue), and it's available for $200, US shipping included. Monday afternoon, Guppy didn't particularly want to eat, or get out of bed after her nap, and she started running a fever. This ended with a spectacular, ah... mess... on the dinner table (and a shower), after which she bounced back considerably. However, she ran a fever most of Tuesday, and is still not eating particularly well, though the fever is finally gone. She slept in quite late and we're taking it easy. Yesterday, despite a child who mostly wanted to be in my lap, I got ALL of the Kickstarter PDF rewards filled. (I think we watched two seasons of Magic Schoolbus.) I love checking off the 'rewards sent' boxes. Today, I did laundry and cleaned, made granola, and picked up an entire carload of coloring books - which is still only about half of my order! Wheee! I have just gotten Guppy down for her nap, and hope to start getting packages out. MORE CHECKBOX ENDORPHINS! I have sold out more than half of my #junicorns! It's the final hour! I'm a wreck! I have chocolate and fine German Lambic prepped for celebration. Thank GOODNESS tomorrow is the last day of this Kickstarter, because my nerves are shot. We funded Fairies and Friends this morning, and we're less than $350 from the AlphaBestiary! I am putting up Dragons, Fairies, and Fantasy Horses Vol 2 reprints as the stretch goal after that, and refreshing my email every few moments. Guppy is begging me to take her on a walk, so we're going to go hit the trails for a little bit with Norway. Serenitrix funded on Kickstarter! And we're already almost halfway less than $190 to the next coloring books, Samantha's Fairies and Friends. And the next one has been revealed! OMG, WE JUST FUNDED FEATHERED FANTASTIC! WE ARE LESS THAN $500 FROM SERENITRIX! HELP I AM STUCK IN CAPSLOCK FROM SHEER EXCITEMENT! So, yes. I am pleased. I'm going to die of adrenaline poisoning (is that a thing??) before the end of the campaign, but am pleased. I love this piece. I'm really happy with how it turned out, and I've already started coloring a copy of it. 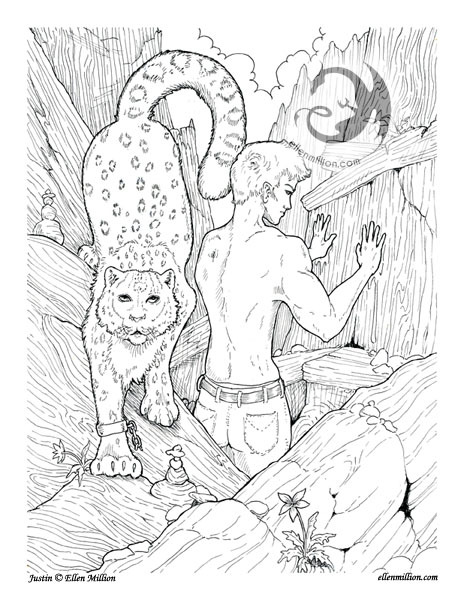 It was originally for the Natural Magic coloring book, but that got stalled due to lack of submissions, so it will hopefully be included in my new solo book. Which is the stretch goal after next at the Kickstarter!! I am SO excited about this book. It is my best yet, for sure, and it's got some of my favorite artwork in it. It's more than half new stuff, with a few things from books that are now out of print (Tam Lin, Taming the Sea, a few sea monsters that were only released half-sized), and four pieces from the new series of collaborative books (Trying on Treasure, Rose Angel, Bearing Gifts, and Snow and Feathers). It also has a superhero weiner dog, and a set of winged kitties, because you couldn't possibly expect it to be all serious. Tentacle Friends (the cover piece) is exclusive to this coloring book. I am seriously bit-between-the-teeth about getting this into print - and we only have a week left and a chunk of money to go. So! 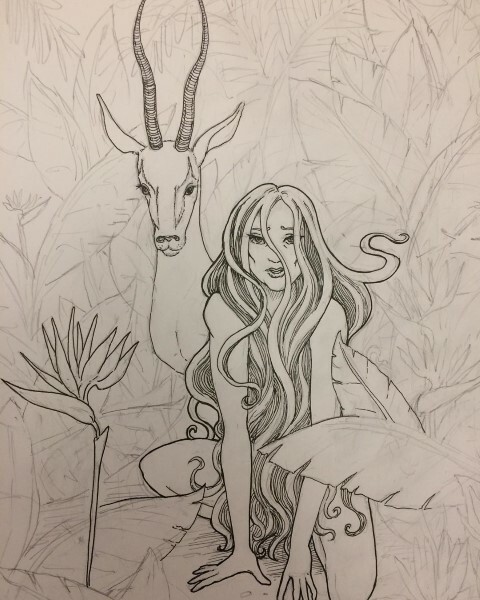 I am also offering a very rare opportunity to commission me to do a coloring page, through the Kickstarter ($400 includes 25 coloring books, all the PDFs, AND a custom page), AND I am offering HALF off any of my available originals as add-ons. If you've been eyeing something, this IS the week to get it. Help make more coloring books happen, and give some original artwork a good home! "Baloney!" he told her. "I call, baloney! You know what I like to do with baloney? I like to put it on a sandwich with lettuce and EAT it!" Big eyes filled with tears. "I don't want to be a SAMMICH! Please don't eat me, Papa!" The same happened again a few nights ago when she asked for food. "There is no more food." "We aren't going to feed you again, we ran out." Four-year-olds are entirely too serious. She is so pooped right now - she got up nearly an hour before the alarm, and although she was nicely quiet and let us sleep, did not go back to sleep herself. She's eaten two cheese-and-mayo sandwiches, and I'm hoping she'll finally go to sleep for at least a little nap before I have to go get her up. So, this weekend was Sketch Fest (I did two sketches), and I also co-hosted a Coloring Tea Party at Sipping Streams, which was SO MUCH fun. (It was also a better show for me than some weekend-long shows that I've done, AND I got a bunch of un-molested art time, AND I got delicious cocoa and tea sandwiches and gorgeous facepainting.) The attendees were all really wonderful and extremely talented, and I absolutely loved seeing them work. Have some inventory to do, and updates to make, and Guppy's quiet time has NOT been quiet. *rubs head* It's going to be an interesting evening... right now she's trying to chainsaw my mouse, so I think my work and blog time is at an end. We funded Equine Enchantment! And I released the cover for Feathered Fantastic! Two weeks to go, and five more titles to unlock! Wheee! I also cleaned the bathroom, did a load of laundry, filled orders, and took Guppy on a park date. My cold is better; though I still sound pretty hoarse, the coughing is much less, and I have a lot more energy. Less than $70 to go to unlock Equine Enchantment at the Kickstarter! Then we'll start funding Splendid and Scaled (Dragons) and I'll release the fourth cover, for Angels. :) So exciting! In less awesome news, I have a cold. I am hoping this is the tail end of it - I seem to be coughing more productively today. I was really dragging this morning, but feel better now. Lots of tea and water! My four-year-old is already counter-culture. And 100% funded! All the kids at preschool picked their favorite colors, and they made a chart to put on the front door. You saw the spread you'd expect - a few pinks, mostly green and blue and purple, a few hold-outs for red and orange. And my kid, whose favorite color has been black for at least a year, all by herself in that column. My poor mother, who would love to make her frilly, colorful dresses, keeps asking despairingly, "Is black really still her favorite color? Really?" I think it is telling that Guppy's favorite song right now is Bad Reputation, in all its rebellious glory. We would listen to nothing else ever if she had her way. After too little time playing at the park, I talked for as long as Guppy would let me with the owner of the local tea shop and some lovely marketing people and should have some exciting things to talk about after the weekend once details are finalized. I also finished the color version of Tentacle Friends, and scanned it, and laid out my next coloring book cover. Miraculously, the house is also clean and I did a load of laundry, mostly fueled by ice cream and the soundtrack to Shrek, which has been on repeat for the last several days. The Kickstarter is at 81%! I kept thinking this was a really SLOW start, then realized that my goal is higher this time, and we're actually doing better than the start that the last multi-book Kickstarter had. (I think I'm just comparing it to some of the other amazing projects I've been watching lately and feeling small. It's all a crazy comparison game. The only way to win is not to play.) We need a liiiiittle more this time to get to all 7 of the coloring books I want to do, so hopefully we keep going at this rate. Because I am SO excited about these coloring books. Easily my best yet! Okay, now I'm off to make au gratin for dinner and take Guppy for a walk. Kickstart some (More!) Coloring Books! Go! Witness my ridiculous mad acting Skillz! Laugh your heart out! I plan to launch it tomorrow morning about 10 AM (2 PM ET). I am very, very nervous. You'd think, this being my fourth Kickstarter, that it would be old hat, but it's still a Really Big Deal. There's a lot more competition for so-called adult coloring books these days. Maybe the market is saturated. Maybe mine just aren't awesome enough to compete! Or maybe I'm just not enough of a marketer to convince people that they are that awesome (because they ARE, darn it). And the video, it is so epic. I will probably never live it down. When you see it, you will realize the lengths to which I will go to sell coloring books. I kickbox*, you guys. Very badly. And I want to apologize in advance, because for the next few weeks, this is going to be a Big Deal in my blog. I promise to try not to make it All Kickstarter, All the Time, but I will undoubtedly blather about it a lot, and link to it every time, because Links Matter. Your links matter, too, and I do hope that you will share it. It is always awkward to ask, but I am really, unbelievably grateful when you believe in my projects enough to spread the word. Anyway, these are my rambling night-before thoughts. *I have never kickboxed in my life. I have only the vaguest Hollywood idea of how it works. This video is wonderfully terrible. It's been three days without Internet. Construction down the road cut our phone line, and (long story omitted) they aren't even trying to fix it until Monday. Or maybe Tuesday. I am a twitchy little addict in the throes of withdrawal, as you might imagine, clinging to my phone. I am still planning to hit go on my Kickstarter Tuesday morning, from the tea house, but this is NOT how I imagined working up to it. If my communication is slow for any reason, please forgive me. I'm probably in the corner gnawing my fingernails off.